For other uses, see YOG (disambiguation). Not to be confused with Junior Olympics (disambiguation). The Youth Olympic Games (YOG) is an international multi-sport event organized by the International Olympic Committee. The games are held every four years in staggered summer and winter events consistent with the current Olympic Games format, though in reverse order with Winter Games held in leap years instead of Summer Games. The first summer version was held in Singapore from 14 to 26 August 2010 while the first winter version was held in Innsbruck, Austria from 13 to 22 January 2012. The age limitation of the athletes is 14 to 18. The idea of such an event was introduced by Johann Rosenzopf from Austria in 1998. On 6 July 2007, International Olympic Committee (IOC) members at the 119th IOC session in Guatemala City approved the creation of a youth version of the Olympic Games, with the intention of sharing the costs of hosting the event between the IOC and the host city, whereas the traveling costs of athletes and coaches were to be paid by the IOC. These Games will also feature cultural exchange programs and opportunities for participants to meet Olympic athletes. Several other Olympic events for youth, like the European Youth Olympic Festival held every other year with summer and winter versions, and the Australian Youth Olympic Festival, have proven successful. The Youth Games are modelled after these sporting events. The YOG are also a successor to the discontinued World Youth Games. The Summer Youth Olympic Games of Singapore in 2010 and Nanjing in 2014 each played host to 3600 athletes and lasted 13 days, whereas the Winter YOG of Innsbruck in 2012 had 1059 athletes and Lillehammer in 2016 had 1100 athletes and lasted 10 days. Even though this exceeded initial estimates, the YOG are still both smaller in size as well as shorter than their senior equivalents. The most recent Summer YOG was the 2018 Summer Youth Olympic Games of Buenos Aires. The next Winter YOG to take place will be the 2020 Winter Youth Olympic Games of Lausanne while the 2022 Summer Youth Olympics will take place in Dakar. The concept of the Youth Olympic Games came from Austrian industrial manager Johann Rosenzopf in 1998. This was in response to growing global concerns about childhood obesity and the dropping participation of youth in sport activities, especially amongst youth in developed nations. It was further recognized that a youth version of the Olympic Games would help foster participations in the Olympic Games. Despite these reasons for having an Olympic event for young people, the IOC's response of holding a purely sporting event was negative. IOC delegates wanted the event to be as much about cultural education and exchange as it was about sports, which is why the Culture and Education Program (CEP) was developed as a component of each celebration of the Games. Jacques Rogge, IOC President, formally announced plans for the Youth Olympic Games at the 119th IOC session in Guatemala City on 6 July 2007. There are several goals for the YOG, and four of them include bringing together the world's best young athletes, offering an introduction into Olympism, innovating in educating and debating Olympic values. The city of Singapore was announced as the host of the inaugural Summer Youth Olympics on 21 February 2008. On 12 December 2008 the IOC announced that Innsbruck, host of the 1964 and 1976 Winter Olympics, would be the host of the inaugural Winter Youth Olympics in 2012. The scale of the Youth Olympic Games is smaller than that of the Olympics, which is intentional and allows for smaller cities to host an Olympic event. Potential host cities are required to keep all events within the same city and no new sports venues should be built. Exceptions to this building moratorium include a media center, amphitheater facilities for classes and workshops, and a village for coaches and athletes. This village is to be the heart of the Games for the athletes, and the hub of activity. No new or unique transportation systems are required as all athletes and coaches will be transported by shuttles. According to bid procedures, the track and field stadium for the opening and closing ceremonies must hold 10,000 people, and a city must have a 2,500-seat aquatics facility (for Summer editions). The original estimated costs for running the Games were US$30 million for the Summer and $15 million to $20 million for Winter Games, these costs do not include infrastructure improvements for venue construction. The IOC has stipulated that costs for infrastructure and venues is to be paid by the host city. The IOC will pay travel costs to the host city and room and board for the athletes and judges, estimated at $11 million. The funding will come from IOC funds and not revenues. The budgets for the final two bids for the inaugural Summer Games as submitted by the IOC came in at $90 million, much higher than the estimated costs. The cost of the first games in Singapore escalated to an estimated S$387 million ($284 million). Sponsors have been slow to sign on for the YOG, due to the fact that it is a new initiative and corporations are not sure what level of exposure they will get. The budget for the inaugural Winter Games to be held in Innsbruck has been estimated at $22.5 million, which does not include infrastructure improvements and venue construction. Over 200 countries and 3,600 athletes participated in the inaugural 2010 Youth Summer Olympics. Participants are placed in the following age groups: 14–15 years, 16–17 years, and 17–18 years. The athlete's age is determined by how old he or she is by 31 December of the year they are participating in the YOG. Qualification to participate in the Youth Olympics is determined by the IOC in conjunction with the International Sport Federations (ISF) for the various sports on the program. To ensure that all nations are represented at the YOG the IOC instituted the concept of Universality Places. A certain number of spots in each event are to be left open for athletes from under-represented nations regardless of qualifying marks. This is to ensure that every nation will be able to send at least four athletes to each Youth Olympic Games. For team tournaments one team per continent will be allowed to compete along with a sixth team either representing the host nation or as proposed by the IF with IOC approval. There is a cap of two teams (one boys' and one girls') per nation. Finally, no nation may enter more than 70 athletes in individual sports. The sports contested at the Youth Games are mainly the same as those Olympic sports scheduled for the traditional Games, but with some adaptations, and a limited number of disciplines and events. For example, in the aquatics sport the IOC decided to include diving and swimming events but excluded synchronized swimming and water polo. Some of the sports have been modified for the Games. The basketball competition uses the 3x3 format, which is a 3-on-3 half-court game; under current rules, the game is played in a single 10-minute period, and the first team to 21 points wins (using a scoring system different from that of the full-court game). Individual skills challenge in basketball is held since 2014. The field hockey was introduced as outdoor format in 2010 Games, but was later changed to the hockey5s a smaller version of indoor played in outdoor in 2014. The cycling disciplines are BMX racing, road cycling and mountain bike racing, while track cycling has been left off the schedule. From 2014, beach volleyball replaced volleyball. The 2018 edition featured 4 new sports: sport climbing, karate, breakdancing and roller speed skating. Added events included BMX freestyle, kitesurfing, cross country running and beach handball replaced handball. The Winter Youth Games features seven sports. Ice hockey will have not only a men's and women's tournament but also an individual skills challenge. In luge, figure skating and short track speed skating there will be mixed NOC events that will allow athletes from various countries to compete together in teams. Alpine and cross-country skiing will have events in which men and women will compete on mixed-gendered teams. Other youth-driven sports may eventually be contested if backed by international sports federations. Education and culture are also key components for the Youth edition. Not only does the education/culture aspect apply to athletes and participants, but also youth around the world and inhabitants of the host city and surrounding regions. To this end a Culture and Education Program (CEP) will be featured at each Games. The first CEP at the 2010 Singapore Games featured events that fostered cooperation amongst athletes of different nations. It had classes on topics ranging from health and fitness to the environment and career planning. Local students from Singapore made booths at the World Culture Village that represented each of the 205 participating National Olympic Committee. The Chat with Champions sessions were the most popular portion of the program. Participants were invited to hear inspirational talks given by former and current Olympic athletes. Also part of the CEP are the Young Ambassadors Programme, Young Reporters Programme and Athlete Role Models. Under the Young Ambassadors Programme, a group of youths aged 18 to 25 years old are nominated by the NOCs to help promote the YOG in their regions and communities, and encourage the athletes to participate in the CEP programmes. The Young Reporters Programme provides journalism students or those who have recently started their journalism careers a cross-platform journalist-training programme and on-the-job experience during the YOG. Young Reporters, between the ages of 18 and 24, are selected by the Continental Associations of National Olympic Committees and will represent each of the five continents. Acting as mentors to help support and advise young Olympians are the Athlete Role Models, who are typically active or recently retired Olympians nominated by the IFs, such as Japanese wrestler Kaori Icho, Italian Simone Farina and Namibian Frank Fredericks. Emphasis on exchange goes beyond the CEP. Another unique feature of the Youth Olympic Games are mixed-gender and mixed-national teams. Triathlon relays, fencing, table tennis, archery and mixed swimming relays are a few of the sports in which athletes from different nations and mixed genders can compete together. YOG organizers are also using social media such as Facebook, Flikr, and Twitter as key platforms for engaging young athletes before, during, and after each celebration of the Games. Multi-lingual, multi-cultural, and multi-age requirements are the targets of the program, which stress the themes of "Learning to know, learning to be, learning to do, and learning to live together". 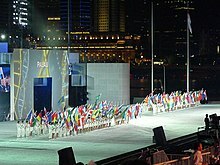 In early November 2007, Athens, Bangkok, Singapore, Moscow, and Turin were selected by the IOC as the five candidate cities to host the inaugural Youth Olympic Games. In January 2008, the candidates were further pared down to just Moscow and Singapore. Finally, on 21 February 2008, Singapore was declared host of the inaugural Youth Olympic Games 2010 via live telecast from Lausanne, Switzerland, winning by a tally of 53 votes to 44 for Moscow. On 2 September 2008 IOC announced that the executive board had shortlisted four cities among the candidates to host the first Winter Youth Olympic Games in 2012. The four candidate cities were Harbin, Innsbruck, Kuopio, and Lillehammer. IOC president Jacques Rogge appointed Pernilla Wiberg to chair the commission which analysed the projects. As with the Summer Games, the list was then shortened to two finalists, Innsbruck and Kuopio, in November 2008. On 12 December 2008, it was announced that Innsbruck beat Kuopio to host the games. Nanjing, China was selected by the IOC over Poznan, Poland to be the host-city of the 2014 Youth Olympics. The election was held on 10 February 2010, two days before the start of the 2010 Winter Olympics in Vancouver. Lillehammer, Norway hosted the 2016 Winter Youth Olympics. ^ "FIS in favor of Youth Olympic Games". FIS. 8 May 2007. Archived from the original on 27 September 2007. Retrieved 20 May 2007. ^ "No kidding: Teens to get Youth Olympic Games". USA Today. 25 April 2007. Retrieved 19 May 2007. ^ "Rogge wants Youth Olympic Games". BBC Sport. 19 March 2007. Retrieved 19 May 2007. ^ "IOC to Introduce Youth Olympic Games in 2010". 25 April 2007. Retrieved 20 May 2007. ^ "1st Summer Youth Olympic Games in 2010" (PDF). International Olympic Committee Department of Communications. 2007. p. 8. Archived from the original (pdf) on 18 November 2007. Retrieved 24 August 2007. ^ "Olympischer Frieden". Frankfurter Allgemeine Zeitung. 27 December 2010. Retrieved 4 February 2011. ^ "Youth Olympic Games" (pdf). International Olympic Committee. p. 28. Retrieved 20 May 2011. ^ a b c d e f Stoneman, Michael. "Welcome to the Family". International Olympic Committee. Retrieved 20 May 2011. ^ a b "Youth Olympic Games" (pdf). International Olympic Committee. p. 35. Retrieved 20 May 2011. ^ "IOC Session: A "go" for Youth Olympic Games". International Olympic Committee. 5 July 2007. Retrieved 5 July 2007. ^ a b c d e f g h i j "Factsheet Youth Olympic Games" (PDF). International Olympic Committee. February 2009. Archived from the original (PDF) on 24 March 2012. Retrieved 20 May 2011. ^ Wang, Jeanette. "Perfect Pitch" (PDF). International Olympic Committee. Retrieved 20 May 2011. ^ "Innsbruck Elected To Host the Inagural Youth Olympic Winter Games In 2012". Gamebids.com. 12 December 2008. Archived from the original on 28 December 2010. Retrieved 20 May 2011. ^ "2018 Youth Olympic Games: Appraising Abuja's Bid Plan". Leadershipeditors.com. 19 March 2011. Retrieved 20 May 2011. ^ "Youth Olympic Games Candidature Procedure and Questionnaire" (pdf). International Olympic Committee. p. 52. Retrieved 7 July 2011. ^ a b Leyl, Sharanjit (15 August 2010). "Youth Olympic Games gamble for Singapore". BBC.com. Retrieved 20 May 2011. ^ "Cost of Youth Games goes up three-fold An extra $265 million". Comsenz Inc. Retrieved 7 July 2011. ^ "Youth Olympic Games to cost $387 million". Singapore Democrats. Retrieved 7 July 2011. ^ "1st Winter Youth Olympic Games in 2012" (pdf). International Olympic Committee. pp. 12–14. Retrieved 7 July 2011. ^ "About Us". Singapore 2010 Youth Olympic Games. Archived from the original on 25 May 2012. Retrieved 19 May 2011. ^ "Youth Olympic Games". International Olympic Committee. Retrieved 19 May 2011. ^ Murphy, Pam. "Youth Olympics:Which Sports?". Livestrong.com. Retrieved 12 July 2011. ^ "Sports-Aquatics". Singapore 2010 Youth Olympic Games. Archived from the original on 27 May 2012. Retrieved 12 July 2011. ^ "Sports-Basketball". Singapore 2010 Youth Olympic Games. Archived from the original on 27 May 2012. Retrieved 12 July 2011. ^ "Sports-Cycling". Singapore 2010 Youth Olympic Games. Archived from the original on 27 May 2012. Retrieved 12 July 2011. ^ "Three new sports to join Buenos Aires 2018 YOG programme". Olympic.org. Retrieved 2016-12-07. ^ "Roller speed added to the Buenos Aires 2018 event programme!". Olympic.org. 2017-03-17. Retrieved 2017-03-18. ^ a b "Sports events and eligibility requirements". Innsbruck 2012 Youth Olympic Games. Retrieved 12 July 2011. ^ a b "Youth Olympic Games" (pdf). International Olympic Committee. p. 42. Retrieved 20 May 2011. ^ "IOC announces the Young Reporters for the Youth Olympic Games". Retrieved 30 January 2016. ^ "Three-time Olympic champion and Athlete Role Model Kaori Icho on her love for wrestling". Retrieved 30 January 2016. ^ "Farina appointed to Youth Olympic Games role". Retrieved 30 January 2016. ^ "Meet Frank Fredericks, Athlete Role Model for Innsbruck 2012!". Retrieved 30 January 2016. ^ "Teenage Kicks: The Inaugural Youth Olympic Games". SportsPro. Retrieved 12 July 2011. ^ "Factsheet Youth Olympic Games" (PDF). International Olympic Committee. Archived from the original (pdf) on 24 March 2012. Retrieved 12 July 2011. ^ a b "Innsbruck Elected To Host the Inagural Youth Olympic Winter Games In 2012". Gamesbids.com. Archived from the original on 6 January 2012. Retrieved 12 July 2011. ^ "Nanjing, China Elected To Host 2014 Summer Youth Olympic Games". Gamesbids.com. Archived from the original on 10 August 2011. Retrieved 12 July 2011. ^ "Lillehammer awarded 2016 Winter Youth Olympic Games". Retrieved 30 January 2016. ^ "1st YOG Singapore 2010". IOC. Retrieved 14 August 2010. ^ "2nd YOG Nanjing 2014". IOC. Retrieved 16 August 2014. ^ "3rd YOG Buenos Aires 2018". IOC. Retrieved 4 July 2013. ^ "1st WYOG Innsbruck 2012". IOC. Retrieved 13 January 2012. ^ "2nd WYOG Lillehammer 2016". IOC. Retrieved 12 February 2016. ^ "3rd WYOG Lausanne 2020". IOC. Retrieved 31 July 2015. Wikimedia Commons has media related to Youth Olympic Games.